The case of a female with a history of trauma to her maxillary central incisors 12 y ago is presented. The right tooth showed signs of root-fracture healing with a dislocated coronal fragment, total pulp canal obliteration (PCO) and contradictory signs and symptoms. The left tooth showed an indistinguishable fracture line but partial PCO in the apical fragment and normal clinical signs. Although the patient was referred for endodontic treatment of the right central incisor, Cone-beam computed tomography (CBCT) was suggested to confirm the nature of the condition. Because CBCT should not be used routinely for endodontic diagnosis but may be justified in "borderline" cases, it was performed in according to the current legal recommendations, avoiding the unnecessary endodontic treatment. PCO is discussed, as the condition involves not only a radiographic reduction of the pulp canal but also an adaptive morphological pattern of pulp response to trauma. The introduction of cone-beam computed tomography (CBCT) initiated new possibilities for diagnosis and prognosis in dental pathologies. CBCT can not only diagnose the presence of periapical lesions, but also be useful in the diagnosis and follow-up of luxation injuries, inflammatory or replacement resorptions, and other pulpal pathologies related to dental traumatology [1,2]. However, CBCT has known limitations, including a possible higher radiation dose to the patient . Several evidence-based guidelines for the use of CBCT in dental and maxillofacial radiology were published to develop comprehensive referral criteria, quality assurance guidelines and optimization strategies for all the providers (radiologists, dentists, physicists and equipment manufactures) [2,4]. Although those guidelines gather the current evidence necessary for sound and scientifically supported clinical use of CBCT based on specific indications, in "selected cases", when conventional radiographs give a negative finding or patients present with contradictory or non-specific clinical signs and symptoms", CBCT may be considered the imaging modality of choice for diagnosis [2,3]. These "selected cases", also named as "borderline cases"  have justified that some authors recommend further research to establish objectively the diagnostic accuracy of CBCT and its impact on management decisions [2,5]. Intra-alveolar root fractures are an uncommon injury, comprising only 0.5%-7% of traumatized permanent teeth [6,7]. In such cases, the long-term prognosis is reported as good, even considering marked displacement of the fragments or lack of immediate treatment . However, in an emergency visit for these causes, repositioning and splinting the fragments in an adequate clinical management are well recommended to avoid potential sequelae [9,10]. Dislocation and diastasis between fragments are factors which have a significant influence upon healing, even if produced by an unchecked repositioning radiographically [6,9,11]. Root-fracture healing (RFH) can take place by interposition between fragments of hard tissue (HT), fibrous connective tissue (CT), fibrous connective tissue and bone (CT+B) or granulation tissue (GT) (i.e., infection/non-healing), depending on the health of dental tissues and the dislocation [6,11]. Several authors have described a positive correlation between dislocation of the coronal fragment and condition of repair, consisting of total pulp obliteration with decreased response to vitality testing, as well as a yellowish appearance of the crown [8,12]. This condition has been named Pulp Canal Obliteration (PCO), and is defined by the American Association of Endodontists as "...a pulpal response to trauma characterized by rapid deposition of hard tissue within the canal space" . PCO of apical fragment alone is seen most often in cases of healing with hard tissue, while PCO of the apical and coronal fragments is frequently found in cases of healing by CT, as well as in teeth with interposition of CT+B . Although PCO is reportedly found in intra-alveolar root-fractured permanent incisors as a post-healing complication, it still represents an important diagnosis and clinical challenge for the odontologist, and therefore must be investigated more extensively [7,14-17]. The use of CBCT (at a later date) has been indicated in the assessment of suspected acute root fractures where conventional intraoral radiographs provide inadequate information for treatment planning [2,3]. When CBCT is compared with bisecting and parallel intraoral radiography, CBCT has the highest diagnostic accuracy for root fractures at any angle [18,19]. However, since the sequelae can arise several years after the injury (with the obvious difficulties in collecting information about the event or its immediate treatment), or complicating the clinical picture with unclear response to vitality tests, discolorations and/or pulp obliterations, the diagnosis can be challenging for even experienced practitioners . We present a borderline case with association of RFH and PCO and 12 y of evolution involving both central incisors where conventional radiographic views offered limited information and CBCT provided further radiographic details. Because CBCT should not be used routinely for endodontic diagnosis but may be justified in "selected" (borderline) cases, dental CBCT was performed in according to the current legal recommendations . The CBCT images allowed diagnosis of different patterns of healing, prevented an unnecessary radical endodontic treatment, and provided an adequate response to the patient's questions regarding potential aesthetic treatments. A 19-y-old female was referred to the Specialist Endodontic Course at the Facultad de Odontología of the Universidad de La Frontera (Temuco, Chile) for endodontic treatment of a discolored maxillary right permanent central incisor (tooth 11). The patient reported that she had fell and blew her central incisors 12 y ago. The same day, she was assisted by her dentist with a bonded split, given the slight mobility of both teeth. Although the patient remembered having suffered pain in her teeth and bleeding of the upper lip, she did not remember how long the splint was maintained, or if she had received any other type of immediate intervention. Likewise, she denied experiencing pain after the initial treatment, or receiving any follow-up treatment in the 12 y since. Clinical examination revealed yellowing and slight discoloration of tooth 11. The tooth had a diminished response to cold from a cotton wool pellet soaked in ethyl chloride (Hygenic® Endo-Ice® Pulp Vitality Refrigerant Spray-5.9 oz Spray Can-Coltene/Whaledent). Even though no mobility was noted the patient mentioned a subtle but persistent sensitivity to palpation and percussion. No abnormal clinical signs were noticed in tooth 21, and the tooth responded normally to cold stimulation (Figure 1). 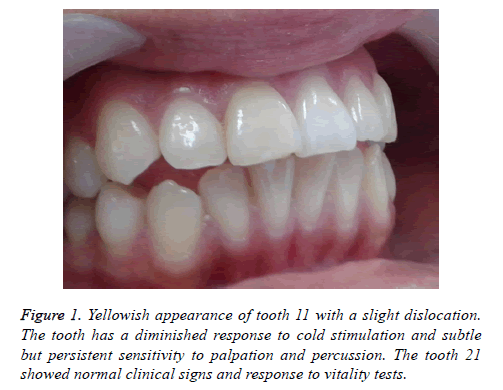 Figure 1: Yellowish appearance of tooth 11 with a slight dislocation. The tooth has a diminished response to cold stimulation and subtle but persistent sensitivity to palpation and percussion. The tooth 21 showed normal clinical signs and response to vitality tests. A periapical radiograph revealed tooth 11 with a root fracture in the middle third, an incomplete root formation, and a total PCO. A slight enlargement of periodontal space and a continuous cortical bone was detected. Radiographically, the maxillary left permanent central incisor (tooth 21) also showed a defective root formation and a lack of continuity, however not as marked as in tooth 11. PCO was limited to the pulp canal space of the apical portion (Figure 2). Figure 2: Radiograph obtained at a 90° horizontal angle to tooth 11, suggesting RFH in both upper central incisors. A slight enlargement of periodontal was detected but the image was not conclusive. Note the total PCO in tooth 11 and the partial PCO in tooth 21. The fracture edges showed signs of external surface resorption processes. Because of the contradictory clinical and radiological signs and symptoms, limited FOV CBCT was considered. In according to legal standards of care, conventional intraoral imaging versus CBCT was discussed with the patient regardless of the costs, and informed consent was requested after the relative risks and benefits of CBCT imaging were considered. The patient was also notified that the referred treatment for tooth 11 was endodontic but CBCT could prove it was not necessary if CBCT offered evidence for it. Having received and discussed all the information, the patient agreed performing CBCT. In tooth 11, CBCT (Vatech Pax Zenith CBCT machine, 120 kVp and 9.0 mA, FOV 8 × 6 cm, voxel size 0.12 mm) revealed horizontal root fracture in the middle third, with slight separation of fragments. This separation was evident in the different axes of both fragments, likely a result of repositioning the coronal fragment during the immediate intervention made by her dentist. However, the fracture space demonstrated healing by CT+B. CBCT confirmed the total PCO in both fragments. Conversely, tooth 21 showed an oblique fracture but no displacement of fragments. The PCO was partial and involves only the apical fragment. An axial view showed different degrees of obliteration of both apical foramens, with complete stenosis of tooth 11 (Figures 3 and 4). Although external surface resorption processes were detected at the fracture edges, no associated periapical lesions were detected in either tooth. Figure 3: (a) CBCT in a coronal view of tooth 11 and 21; (b) Axial images from multi-slice CBCT. Note the different degrees of obliteration with total PCO and stenosis of tooth 8 and partial PCO of tooth 21. Tooth 11 showed a minimal presence of a canal in the last axial view (*). 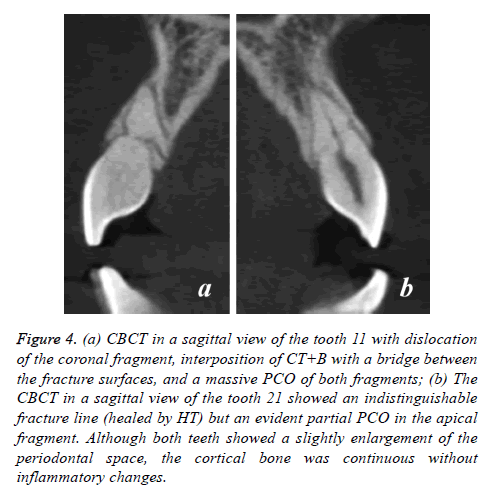 Figure 4: (a) CBCT in a sagittal view of the tooth 11 with dislocation of the coronal fragment, interposition of CT+B with a bridge between the fracture surfaces, and a massive PCO of both fragments; (b) The CBCT in a sagittal view of the tooth 21 showed an indistinguishable fracture line (healed by HT) but an evident partial PCO in the apical fragment. Although both teeth showed a slightly enlargement of the periodontal space, the cortical bone was continuous without inflammatory changes. Given the confirmation of there was no apical affection and the diagnosis of RFH and PCO was done, the patient was informed that endodontic treatment of tooth 11 was unnecessary. However, because the initial consultation was for aesthetic reasons (the patient analyzed the possibility of orthodontic treatment due to abnormal positioning of tooth 11 in the arch), she was instructed not to initiate any orthodontic treatment, and to eventually ask for a ceramic laminate veneer if the minimal discoloration became problematic. The patient was recommended to follow-up with regular clinical and radiographic. While both tooth 11 and 21 showed consequences of trauma, each showed different patterns of healing and sequelae. According to the most relevant classifications , the RFH of tooth 21 seems to be formed by hard tissue union (HT) where coronal and apical fragments were closely approximated and the fracture line was indistinct. It was stated that the frequency of HT increased with lessened separation of fragments following concussion or subluxations [9,14]. Kahler et al. mentioned that in these cases, pulp often remains unaffected, thereby allowing this type of healing . The age of the patient at the time of trauma presupposes a wide apical foramen with greater interface between root canal and vasculature of apical pulp, and possibly between surrounding periodontium. This condition would favor the growth of new blood vessels into the pulp, which positively influence healing potential at the fracture site [9,14]. Although the patient does not remember specific details of the event or its treatment (an obvious limitation of this report), normal positioning of tooth 21 and its clinical and radiographic features may indicate an appropriate repositioning or, at least, its non-dislocation at the event. Tooth 11 shows a different pattern of RFH. Dislocation of the coronal fragment was evident, as well as the interposition of CT+B with a bridge between the fracture surfaces, and massive PCO of both fragments. This outcome is closely related to an extended injury conditioning a similar scenario to tooth luxation, however only of the coronal fragment and with the same parameters that determined long-term prognosis . Lack of displacement of the coronal fragment indicates an optimal condition, and the separation between fragments gives preference to CT+B healing with an extension of these tissues entering the fracture line [9,20]. Although Andreasen et al. affirmed that too few displaced teeth were available in their investigation to match a non-splinting group with a pattern of healing ; we believe that tooth 11 was not properly repositioned and/or splinted. Likewise, the patient noticed that splinting was performed, possibly resulting in the immobility of the coronal fragment and the CT+B response. The same authors reported a scarce 5% of this type of healing, primarily from 9 to 15 y of age, which must be related to the vertical growth of the alveolar process, thereby allowing the interposition of CT+B as seen in the presented case . Despite the extent of the injury, survival of the pulp was a positive result of root development and immobilization . It was stated that although immature teeth with incomplete root fractures may not require immobilization procedures, splinting is necessary if multiple injuries are evident, as in our case . The PCO is a well-recognized sequela of luxation injuries [16,17], more frequent in extrusions, lateral luxations and intrusions than in concussions or subluxations . This condition is recognized as an outcome after revascularization of an injured pulp when immature teeth survived trauma, demonstrating the high healing capacity of a young pulp [6,15,20]. In cases of RFH, the scenario seems not only a pulpal phenomenon but also a competition between pulp and periodontium with the same predictors applied for luxation injuries . However, displacement of the coronal fragment seems to complicate the healing process more than in cases of only HT deposited at the fracture site. Dislocation can lead to pulpal healing and RFH simultaneously, in that PCO represents the own healing process of the pulp to the injury. According to Andreasen and Kahler this could allow radiographic diagnosis of RFH type: if the coronal fragment remains unchanged, healing can be diagnosed as HT, whereas if the coronal root canal becomes obliterated, the diagnosis is CT+B . In our case, these diagnoses coordinated with teeth 21 and 11, respectively. Limited peripheral rounding’s of the fractures edges on both teeth represent effects of external surface resorption processes, and have commonly been reported in these cases . Although the term "PCO" is often used to name a clinical/ radiological condition , the relationship between this obliteration and its histological nature has been repeatedly mentioned, interpreted as a healing phenomenon . The apposition of this new hard tissue is resumed a certain period after of the event, however with an abnormal structure containing cell inclusions and vascular inclusions that resemble bone and cementum ("cellular dentin") . Other authors have used the term "dystrophic calcification", "metaplasia" and "osteodentine" . Either repairing tooth luxation injuries or fusing dislocated root fragments, this deposition of hard tissue represents a particular response of the cells resulting in an abnormal and reparative in nature tissue with specific characteristics and dynamics [15-17,20]. This condition seems to be a time-dependent chronic response, with additional traumas acting as "triggers" for reparation and resorption [14-17]. This context constitutes a more complex pattern than simple "mineralization" of the pulp where "Calcific Metamorphosis" (CM)  appears to be the more appropriate term to name this morphological adaptive pattern . Since 1982, this phenomenon has been considered "a treatment dilemma"  due to its contradictory clinical and radiological expressions, and this situation has not changed today [16,17]. This is a perfect example of a diagnostic "borderline" situation. The clinical and radiological manifestations of PCO, so far beyond their frequently reported association with RFH, are not a minor problem considering the condition has diffuse signs and can be detected several years following trauma. Root fractures are relatively rare; however discolorations and/or weaker responses to pulpal sensibility testing are rarer among fractured teeth . Although possible late complications of PCO include development of pulp necrosis and periapical changes, this has only been reported in 7%-16% of cases, whereby early prophylactic endodontic intervention is not supported [11,12]. According to Malmgren and Hubel, it is important to note that discoloration and/or loss of sensibility per se do not indicate pulp necrosis, and the corroboration of pulp calcification and bony changes through radiographic images is the most significant sign to consider for correct diagnosis . In this context, and in response to a patient who cannot remember a distant traumatic event, the array of different therapeutic possibilities (aesthetic, restorative, prosthodontic and even orthodontic treatments) may be problematic . In the presented case, the patient was referred to endodontic treatment of the discolored tooth 11. This tooth showed not only altered sensitivity responses but also unclear and no definitive radiographic evidence. Although the tooth does not present clear and reliable evidence of pulp necrosis or apical changes, the PCO fall into the "high difficulty" assessment of the American Association of Endodontists (AAE), meaning "an exceptionally complicated preoperative condition" . In according to the recommendations of AAE and the American Academy of Oral and Maxillofacial Radiology (AAOMR) for preoperative radiographs in the diagnostic phase of endodontic therapy, even though "intraoral radiographs should be considered the imaging modality of choice in the evaluation of the endodontic patient", "CBCT should be considered the imaging modality of choice for diagnosis in patients who present with contradictory or non-specific clinical signs and symptoms associated with untreated or previously endodontically treated teeth" . The same recommendations mentioned that CBCT is justifiable for intra-appointment identification and localization of calcified canals when intraoperative endodontic manoeuvres are performed . In our case, CBCT avoided an unnecessary and impractical endodontic treatment. We coincide with Gulsahi et al. in that the use of CBCT in proper cases would prevent such needless treatments by providing an accurate diagnosis . Regarding the subsequent treatments of tooth 11, suggestions were consistent with those recommended by the literature: 1) While orthodontic movement of a teeth with RFH and PCO is not a contraindication, this procedure depends on the type of healing and location of the fracture . In cases of fractures in the middle third of the root where the fragments are separated, orthodontic movements may threaten tooth integrity , even more if fragments are welded only by a small bridge of hard tissue, as seen in our case; 2) Ceramic veneers have been recommended as a non-invasive treatment of discoloration given they restore aesthetics and functions while preserving tooth substance . Intra-oral radiography is the most common examination method used to detect RFH, but its accuracy is poor. Due to superimposition of anatomical and restorative entities, projection radiography has a low sensitivity for detection of fractures. CBCT was considered the most reliable imaging modality to resolve these difficulties [18,19,26]. In our case, sagittal CBCT slices show the location of fractures and dislocation of the coronal fragment in tooth 11. The axial view confirms stenosis of its apical foramen. In accordance with several authors, there is considerable interest regarding the advantages of CBCT for diagnosis of RFH and their sequelae, but more experimental and clinical studies are needed [2,27,28]. CBCT has been recommended in borderline cases when intraoral radiographs give negative findings or when there are contradictory positive clinical signs and symptoms . However, it was emphasized that CBCT should not be used routinely for endodontic diagnosis or for screening purposes [2-4]. CBCT should be requested only in cases where the benefits outweigh the potential radiation risks, and other diagnostic procedures should be discussed with the patient regardless of the costs; all information provided, motivations for diagnostic or treatment guidance with a CBCT examination should be consent by the patient and documented [4,29]. In the presented case, the patient was informed of the availability of CBCT to examine her condition because of the complexity of signs and symptoms, and to the overall benefit of CBCT relating to the specific outcome: to avoid an unnecessary endodontic treatment. We believe that intraoral radiographs were diagnostically insufficient and CBCT was the higher sensitivity method for diagnosis of this special condition. Even though pros and cons were carefully evaluated and discussed with the patient in according to the current standards of care, we coincide with Scarfe in that the use of CBCT "should be justified from case to case and never advocated as routine" . Since CBCT offers the possibility of a comprehensive assessment of dislocated root-fractures associated with PCO , we believe that this rare condition needs to be considered, or at least mentioned their particular clinical and radiological features in the current guidelines for the safe use of dental and maxillofacial CBCT. The professional standard for CBCT is an appropriate care: "to choose CBCT imaging for each patient "wisely" based on selection criteria derived from the best available evidence" . PCO can be a long-term consequence of RFH in cases involving a dislocated coronal fragment, and this association can be considered as a "borderline case" due to the particularly contradictory clinical signs and symptoms. Although PCO should strictly designate a phenomenon of radiographic stenosis/shrinking/obliteration of the pulp canal, this term has also been used indiscriminately to name the yellowish aspect of the crown and a decreased response to vitality testing, or even its histological appearance. Since this condition is a rare phenomenon of pulp adaption to trauma with a probable cellular origin, the unwonted term of "Calcific Metamorphosis" (CM) seems to be more appropriate to name this morphological adaptive pattern, and is suggested. More reports and research on CM could help solve the diagnostic, prognostic and therapeutic complexity of this condition more efficiently. Since PCO (CM) it is not explicitly mentioned as a "special" ("borderline") case in the current recommendations for use of CBCT, when present, this rare condition should be considered and discussed with the patient as a potential indication if there is a possibility of greater benefit to him/her. Gulsahi A, Ates U, Tirali RE, Cehreli SB. Use of cone-beam computed tomography in diagnosis of an otherwise undetected periapical lesion in an anomalous tooth. Oral Radiol 2014; 30: 111-114. European Commission (EC). Radiation protection no. 172: evidence based guidelines on cone beam CT for dental and maxillofacial radiology. Office for Official Publications of the European Communities, Luxembourg 2012. Special Committee to Revise the Joint AAE/AAOMR Position Statement on use of CBCT in Endodontics. AAE and AAOMR joint position statement: Use of cone beam computed tomography in endodontics 2015 update. Oral Surg Oral Med Oral Pathol Oral Radiol 2015; 120: 508-512. Noffke CE, Farman AG, Nel S, Nzima N. Guidelines for the safe use of dental and maxillofacial CBCT: a review with recommendations for South Africa. SADJ 2011; 66: 262-266. Kiljunen T, Kaasalainen T, Suomalainen A, Kortesniemi M. Dental cone beam CT: A review. Phys Med 2015; 31: 844-860. Andreasen FM, Andreasen JO, Cvek M. Root fractures. Textbook and color atlas of traumatic injuries to the teeth (4th ed). Wiley-Blackwell, Copenhagen 2007; 337-371. Malmgren B, Hübel S. Transient discoloration of the coronal fragment in intra-alveolar root fractures. Dent Traumatol 2012; 28: 200-204. Jacobsen I, Zachrisson BU. Repair characteristics of root fractures in permanent anterior teeth. Scand J Dent Res 1975; 83: 355-364. Andreasen JO, Andreasen FM, Mejàre I, Cvek M. Healing of 400 intra-alveolar root fractures. Effect of treatment factors such as treatment delay, repositioning, splinting type and period and antibiotics. Dent Traumatol 2004; 20: 203-211. Choi Y, Hong SO, Lee SR, Min KS, Park SJ. Healing after horizontal root fractures: 3 cases with 2-year follow-up. Restor Dent Endod 2014; 39: 126-131. Roig M, Espona J, Mercadé M, Duran-Sindreu F. Horizontal root fracture treated with MTA, a case report with a 10-year follow-up. Dent Traumatol 2011; 27: 460-463. Andreasen FM, Andreasen JO. Luxation injuries of permanent teeth: general findings. Textbook and color atlas of traumatic injuries to the teeth (4th ed). Wiley-Blackwell, Copenhagen 2007; 372-403. Siddiqui SH. Management of pulp canal obliteration using the modified-tip instrument technique. Int J Health Sci (Qassim) 2014; 8: 426-428. Andreasen FM, Andreasen JO, Bayer T. Prognosis of root-fractured permanent incisors--prediction of healing modalities. Endod Dent Traumatol 1989; 5: 11-22. Cvek M, Tsilingaridis G, Andreasen JO. Survival of 534 incisors after intra-alveolar root fracture in patients aged 7-17 years. Dent Traumatol 2008; 24: 379-387. Fonseca GM, Fonseca MM. Calcific metamorphosis with pathological root resorption in permanent teeth: morphohistometric evaluation of two cases. Int J Morphol 2015; 33: 712-718. Malhotra N, Mala K. Calcific metamorphosis. Literature review and clinical strategies. Dent Update 2013; 40: 48-58. Iikubo M, Kamio T, Hashimoto N, Nishioka T, Wakoh M, Sano T, Igarashi C, Kobayashi K, Seki K, Katsumata A, Ariji E, Sasano T, Sakamoto M, Kojima I. Comparison of bisecting and parallel intraoral radiography and cone-beam computed tomography for detecting various horizontal angle root fractures. Oral Radiol 2015; 31: 173-180. Parrone MT, Bechara B, Deahl ST 2nd, Ruparel NB, Katkar R, Noujeim M. Cone beam computed tomography image optimization to detect root fractures in endodontically treated teeth: an in vitro (phantom) study. Oral Surg Oral Med Oral Pathol Oral Radiol 2017; 123: 613-620. Andreasen FM, Kahler B. Pulpal response after acute dental injury in the permanent dentition: clinical implications-a review. J Endod 2015; 41: 299-308. Patterson SS, Mitchell DF. Calcific metamorphosis of the dental pulp. Oral Surg Oral Med Oral Pathol 1965; 20: 94-101. Smith JW. Calcific metamorphosis: a treatment dilemma. Oral Surg Oral Med Oral Pathol 1982; 54: 441-444. American Association of Endodontists. AAE endodontic case difficulty assessment and referral. Endodontics 2005; 1-7. Malmgren O, Malmgren B. Orthodontic management of the traumatized dentition. Textbook and color atlas of traumatic injuries to the teeth (4th ed). Wiley-Blackwell, Copenhagen 2007; 669-715. Andreasen FM, Andreasen JO. Crown fractures. Textbook and color atlas of traumatic injuries to the teeth (4th ed). Wiley-Blackwell, Copenhagen 2007; 297. Makowiecki P, Witek A, Pol J, Buczkowska-Radli?ska J. The maintenance of pulp health 17 years after root fracture in a maxillary incisor illustrating the diagnostic benefits of cone bean computed tomography. Int Endod J 2014; 47: 889-895. Krastl G, Zehnder MS, Connert T, Weiger R, Kühl S. Guided endodontics: a novel treatment approach for teeth with pulp canal calcification and apical pathology. Dent Traumatol 2016; 32: 240-246. May JJ, Cohenca N, Peters OA. Contemporary management of horizontal root fractures to the permanent dentition: diagnosis-radiologic assessment to include cone-beam computed tomography. J Endod 2013; 39: S20-25. Scarfe WC. "All that glitters is not gold": standards for cone-beam computerized tomographic imaging. Oral Surg Oral Med Oral Pathol Oral Radiol Endod 2011; 111: 402-408. Fagundes Ddos S, de Mendonça IL, de Albuquerque MT, Inojosa Ide F. Spontaneous healing responses detected by cone-beam computed tomography of horizontal root fractures: a report of two cases. Dent Traumatol 2014; 30: 484-487.